The It Is Written Bible Study Guides are a great way to learn and share the timeless truths of God’s Word. They're attractive, modern, and easy to use. While this series of study guides provides a practical and in-depth study experience, they are formatted in a simple question-and-answer style that will help you find and understand the Bible’s answers to your deepest questions. 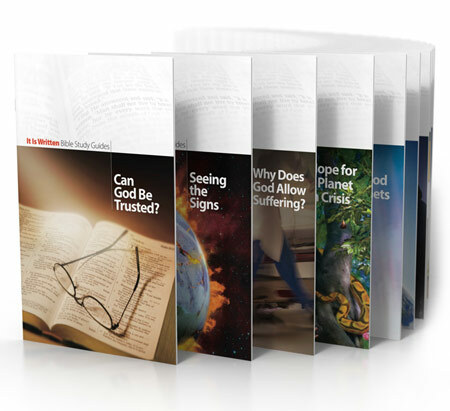 No matter what your background, worldview, or religious preference, these guides will speak to you directly about your life, salvation, and what the future holds. The It Is Written Study Guides help to remove the confusion, mystery, and misapprehension that many have had about God and the Bible. Order your free study guides today, and discover the security and hope that God’s Word can give! (Example: AA-123). If provided on advertisement, enter your "Offer Code" for faster processing of your request.